Lock in a great price for Lemon Tree House – rated 9.1 by recent guests! Andros is such a gorgeous island! Perfect place for someone who wants to relax, enjoy beautiful beaches and amazing hikes. Location of the hostel is great! 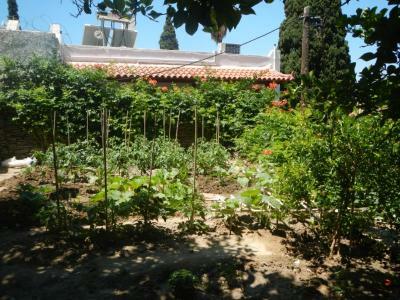 The owner is very welcoming and has many activities to suggest. 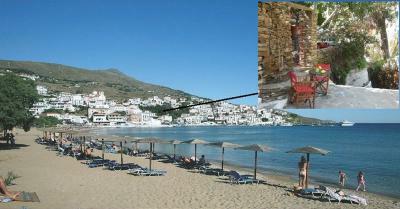 Miltos is the world's best host, so helpful, really helps you see the island and makes great breakfasts! Lovely stay at the lemon tree house, clean and completely atypical, I really enjoyed my stay! Amazing hospitality, the host makes you feel like a real guest. This is what I was looking for. Fantastic sunset, hill and sea view from roof. Completely family environment, I felt like I am at my close relative's house in Andros. The host was kind to drop at the ferry with his car and also gave a route plan for a fantastic hiking day. 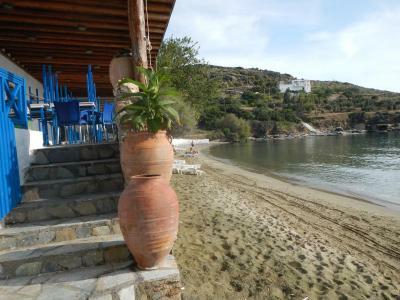 Excellent location near Batsi sea beach and taverns. Thank you Miltos, will stay at yours when I come to Andros again. The apartman is very nice and colorful, and you are in the green but in the center. The owners are very friendly and helpfull, and Miltos took us around the island by car, he is a perfect guide. The hostal has a very nice roof terrace and the ambiance under the lemon tree branches is a little magical. The hostel is one step away from the city center and the owners are lovely. The owners even organised a night with music and give you all the info you need about the best beaches and hikes. Great hosts - Militos and Eleanor - provided many suggestions for activities. Decent breakfast. I stayed in a nice private room, but good feeling of community with the other guests. Nice quiet location. Good wi-fi. Very enjoyable stay and cannot recommend too highly. Miltos and Elena were so welcoming and friendly. They gave us such great advice and without this we definitely wouldn't of been to discover the island the way we did. We were so sad to leave the beautiful lemon tree and will most definitely be back. Located in a small forest at the center of Batsi and just 350 feet from the beach, Lemon Tree features a terrace, an outdoor kitchen and views of the garden and the sea. All units feature a seating area to relax in after a busy day. A terrace or patio are also featured. The center of the village is within 328 feet, where an array of shops, bars and restaurants can be found. When would you like to stay at Lemon Tree House? House Rules Lemon Tree House takes special requests – add in the next step! That there wasn't really a chill lounge area with comfortable chairs. Be aware of mosquitoes at night, but is a small price for the natural location.